Today's #FebPhotoADay challenge was "Words". You would think it would be an easy challenge... we're surrounded by words all day long. There are signs to read everywhere. Nothing really spoke to me, though. Nothing really said "photo challenge worthy". 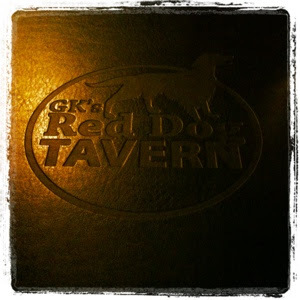 Then tonight, after a busy day, we went out to GK's Red Dog Tavern at the Madison Hotel to celebrate Nick's birthday. The Cesar salad was the best I've had in ages. I had an amazing steak that I split with the girls. Nick had some lamb that he said was great. The fries were way too good. The mashed potatoes were amazing. Even the veggies were yummy. And then the girls had the cutest little mini ice cream cone sampler and I shared my orange creamsicle cake with Nick. I don't even want to tell you how delicious my Mexican coffee was. So Nick's birthday was pretty much a dinner success. Finally... the words above... they spoke to me. Well... they at least spoke to my stomach. Make sure you click over to Fat Mum Slim to check out the #FebPhotoADay link list for more pics!